At the foot of Mt. Tai we review the present state of our journey. The prospects for the next days are bleak. The planned biking through idyllic countryside in Shandong won’t happen: the side-roads we were supposed to take are either undergoing repairs or have dilapidated, as we have learned from recent experience. 350 km of Interstate till Qingdao then. A busy interstate with trucks and buses, because in Shandong, unlike Jiangsu, the interstate is free of toll, and most of the heavy traffic goes here in order to avoid the high-way taxes. Not only will our way be full with roaring traffic, but it will also be going steadily uphill. We have already discovered that for our 240+ kg family vehicle even the smallest hill equals Mt. Tai. After the rain and wind from the previous day the mood in the children trailer is close to mutiny, and I have to admit, it is rather contagious. Volker bravely ventures to move our vehicle alone across Shandong, while I keep to the other goal of the journey – introducing China to our kids. The spirits rise as Sarah and Nora learn that we will take a train ride to the City of Kites. Almost 300 km away from Mt. Tai, in central Shandong, lays the town of Weifang, which in 1988 was officially declared to be the Kite Capital of the World. 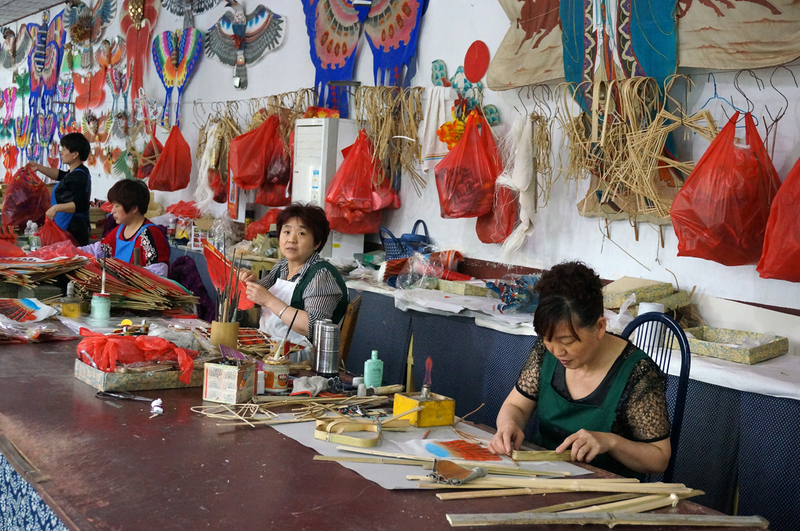 Weifang has been renowned for centuries for its traditional handicrafts, especially for woodblock New Year prints and kites. We have missed merely by a week the International Kite Festival, held here annually for the last twenty years in late April. But if we won’t see hundreds of kites soaring up in the sky, we can at least view them in the Kite Museum, the largest of its sort in the world. And one of the most imaginative places to see Chinese folk art and its fantastic world of colours and patterns. All around us hover flamboyant birds and animals: eagles, peacocks and phoenixes, dragonflies and butterflies, frogs and goldfish, tigers and centipedes with dragon heads. And then there are the heroes of Chinese myths: the Monkey King, the Eight Immortals, the Moon Fairy, even the First Emperor of China and Ancestor Yang – the founder of the Weifang artisan clan, – are made to soar into the skies. Three dimensional flower baskets, towers, and whole streets scenes complete with human figures are also sent up into heaven. Other kites play music in the sky when the wind blows through the pipes attached to them. In the evening we exit the museum shop with three voluminous boxes with kites, bought in the museum shop before I have considered the logistic problems involved once we go back to our tandem. On the next day we visit the place where kites are traditionally made: the village of Yangjia bu, which has been since the 16th century one of the major Chinese centres for woodblock prints and kite production. My heart sinks a bit when on my map I find Yangjia bu Folk Arts Park: it has been less than a week since our experience with the newly built Ancient Town of Tai’er zhuang. (link) Once beyond the ubiquitous city wall, we are greeted by gods and auspicious symbols from the traditional prints in the form of monumental brightly coloured sculptures. The village museums of kites and of New Year prints, on the other hand, are marked by the high-tech trends of the new millennium – traditional prints are set among elaborate neon light installations, more fitting to night-club interiors. But the village alleys are relaxed and homely, with clothes drying in the sun and small gardens of young onion and garlic growing among the old houses. The streets are empty, apart from few locals and bored souvenir vendors. Many of the doors are decorated with colourful prints of the door gods, who guard the household, and with red scrolls with New Year couplets. “Mama, look! Natasha!” Natasha? Who is Natasha? Sarah is pointing to a life-size figure of a blond woman in traditional Chinese dress, who seems vaguely familiar. Yes! That’s the young actress, whom we watched in a TV documentary only the night before. She was telling of her experience as a Chinese Russian and of acting in Chinese movies, and I had to translate all Chinese and Russian conversations to the two curious girls. As we move further into the village we see on houses and walls more movie shots, some of which I have already glimpsed on various TV screens along our journey. They are all from the recent blockbuster TV series “Dazhang Gate”, which told the story of Yangjia bu artisans during the anti-Japanese war in the 1930-ties, and which was shot in these very streets. In the print workshops we watch how New Year pictures are made – from the carving of the wooden plates, through printing of the black outline picture, till printing of each single colour from a separate plate. Sarah and Nora observe entranced a master who adds violet colour to a batch of prints, and Sarah almost rips the thick brush out of his hands. “I want also to print, please, ask him to let me print”. In the workshop next doors Sarah and Nora are allowed to try their hand at printing – and so we leave with our personally made New Year prints. The kite workshop comes next: bamboo strips are bent and tied to make the frame, patterned paper is pasted on frames, various parts are put together. Sarah and Nora, of course, want to built their own kites and I already see in horror two more kite boxes added to our pile. Luckily, they lose interest when they see the tiny little kites that they would be allowed to paint – kites, too small to rise into the sky. We enter the village temple next, attracted by the chants and prayers of a group of local women. Sarah and Nora pull me over the threshold: “Mama, come! I want to pray to Buddha too!” “What do you want to pray to Buddha for?” “To have money!” Oh-oh! 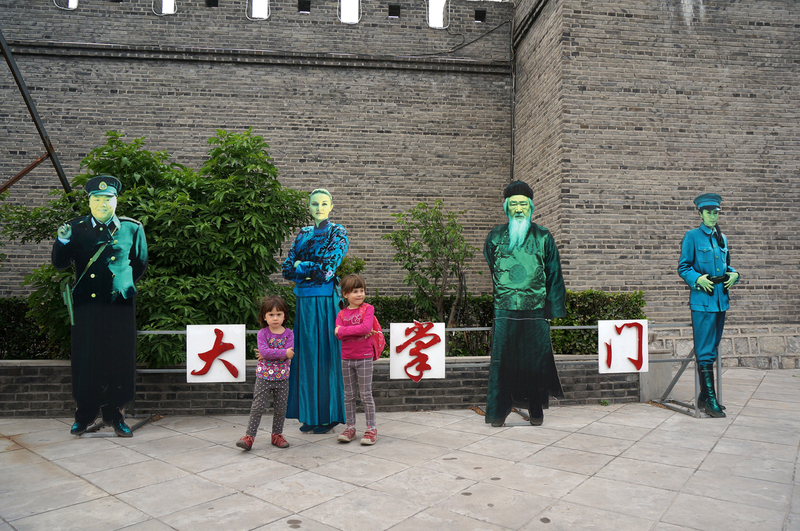 Our girls are absorbing Chinese culture like sponges. May be a bit too quickly.